One of the main features of OpenTX is its use of a sound pack placed on a SD card. This sound pack contains audio files used for sounds and announcements. Audio files are placed on an optional SD Card. Check the transmitter documentation from its manufacturer to determine which SD card to use. 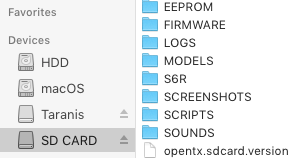 If a SD Card is present when the Tx is turned on OpenTX check its root/top level folder for a file to determine if the correct sound pack version is being used. If the incorrect version is being used then it is possible that some announcements such as telemetry units will be incorrect. 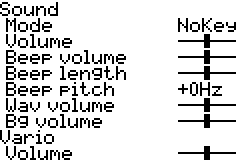 The two files below list the differences between the sound files for OpenTX 2.1 and OpenTX 2.2V0010. Sounds packs are sets of audio files that use a file names, formats and folder arrangement that OpenTX recognizes. A sound pack is available by downloading the SD Card contents from within Companion. 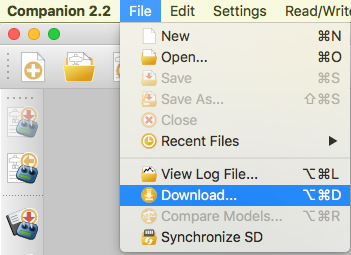 The zip file available for download depends on the Companion radio profile being used. Click on the zip file link to download the microSD card contents. Extract the ZIP file to the root/top level folder of the microSD Card. The sound mapping/definitions csv file is used to generate audio files with phrases such as telemetry lost/recovered and units. It is a text file with lines of text. One line per sound file. Each line has three parts separated by semicolons. E.g. SOUNDS/en/SYSTEM;hello.wav;Welcome to open tea ex! The root, top level. This only contains language folders. This contains audio files, model and system folders. These files are accessed by Global & Special Functions. Use S1, SA, SB and THR up and down to control the volume and hear the sounds. When the model is loaded this file gets played. Note: The file name is “name.wav” regardless of what the model name is. Note: There is no equivalent for a switch not in a particular position (!SA↑,!SA–,!SA↓). Note: There is no equivalent for a switch not in a particular position (!L1↑,!L1↓). Replace spaces in the flight mode name with an underscore. Pick a file from the list. Say the value of the selected parameter when the switch is active. This write up was first contributed to the OpenTX 2.2 documentation (2017 May). Subsequent edits may not be reflected either here or there.